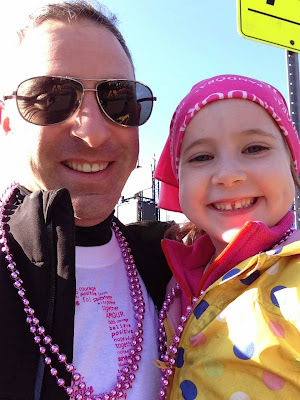 This past weekend my family and I continued our longstanding tradition of participating in CIBC's Run for the Cure (not to be confused with Komen's - a different beast altogether, though also in support of breast cancer research). We love it because it's a very accessible race for kids with lots of excitement, huge crowds with fun costumes, and a 1km option for little legs. Participating and learning about the race helps my children to learn about charity, community spirit, fundraising, and active living. 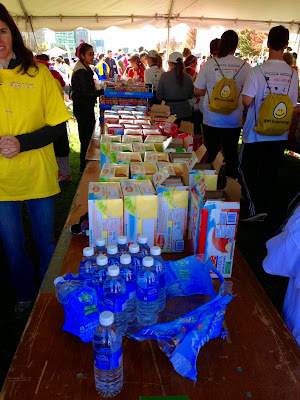 But it also teaches them that doing a teeny tiny bit of exercise warrants being fed, as the food tent is just steps from the finish line and loudspeakers (and food) beckon their visitations. The fact of the matter is that neither a 1km nor a 5km run require any refuelling whatsoever as our bodies have more than sufficient supplies of fuel to get us through such short durations and distances. The myth that exercise warrants or deserves a food reward is part of our broken societal approach to food as a whole and may well be a contributor to the fact that despite the laws of thermodynamics suggesting they should do otherwise, exercise only interventions meant to address weight tend to fail miserably in part because we've been taught (and do) to eat "because we exercised". And what of the food in the food tent? Well no doubt in large part due to our ridiculous national Food Guide that still lists juice as a fruit serving, there were post-breakfast (the race began at 9:30am) large cans of juice containing nearly 200 calories and 10 teaspoons of free sugar. There were also 260 calorie bagels with an additional 1.5 teaspoons of free sugar, bananas, and if you were lucky enough to get there first and were so inclined, they also had a few bottles of water (compare and contrast the bottled water availability to the boxes of juice cans in the photo up above that I took from the end of the table). Of course this isn't unique to the Run for the Cure, but true of most short duration/distance community races (both charitable and not) that I've run. Given the organizations involved are deeply invested in improving health, either through charity or through fitness, their food offerings are an unwelcome contradiction of their aims.